After extensive customer feedback, One in a Million has re-launched with additional features including an integrated chat system, improved graphical content and games that run every hour. One in a Million is an online betting game reminiscent of the popular TV game show Deal or No Deal. Regulated by the UK Gambling Commission, One in a Million (OIAM) is a new peer-to-peer online feature game that fuses elements from other popular games like bingo, poker, the lottery and game shows like Deal or No-Deal. New game features bring together the ease and playability of bingo, the nerves of steel from poker and a deal or no-deal feel, where users can leave the game at any time (as long as they are still in play). 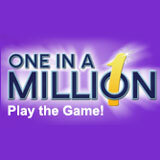 One in a Million is a multi-player game with unrivalled odds. Quite simply it is a player vs player random elimination game. Players can buy up to 9999 seats per game for a cost of 1p, 10p, or £1. Over a 10-round period the seats progress to win prizes. In each game the prize pool is made up by those that have entered with a maximum prize pool up to £10,000, £100,000, and £1,000,000 respectively. Throughout the game players have the choice to collect your prize at the end of each round. However by choosing to continue to the later rounds they have a greater chance of winning larger cash prizes. The greater the risk, the higher the reward. Watching the video really helped to understand how the game works, look forward to playing!